Posted on 17 Aug 15 by J.P.
My dad used to spend time in his favorite chair reading aviation magazines. Like most pilots, he would review accident reports, mostly as a learning exercise. He commented to me on my more than one occasion that an accident occurred due to pilot error. He’d say that 90-95% of general aviation accidents were due to pilot error. Experience makes us better pilots. No matter what type of license we have, how many certifications we carry or how often we go on a checkride, we are always learning. A good pilot is always a student pilot. A fellow aviation videographer once commented that experience can be the hardest way to learn, because the test comes first. If we pass the test, we gain knowledge through that experience. If we fail the test, the results can be fatal. I learned from my experience. Luckily, I didn’t screw anything up bad enough to have dire consequences. When I got home, I took a moment to reflect on what I had learned from that flight. I keep a notebook with all the things I learn through this sort of experience and I try to write something down after each flight. This is what makes me a better pilot. During my student training I scared myself to the point of questioning if I wanted to continue this journey, but then I remembered how much I love being in the air, behind the yoke, thousands of feet above the planet and I realized that I would not be content with my feet planted firmly on the ground. I treat my love of aviation with the utmost respect. I balance my ability against the conditions of any given moment. I minimize the risks to the best of my ability and I strive to never be too comfortable or complacent. And most of all, I never stop learning and I try to never let my ego get the best of me. Video: First Grass Strip Landing. Posted on 9 Aug 15 by J.P.
Posted on 3 Aug 15 by J.P.
We went up for the flight after the winds died down a bit; the airport had a 10 knot direct crosswind for most of the day yesterday. I took the opportunity to practice some crosswind landings while Mother Nature obliged herself. I’m still not completely happy with my crosswind landing performance, but practice will make eventually make perfect and I’ll get where I want to be. Most importantly, I can safely get an airplane down in a decent crosswind, it just still feels a little overwhelming to me and I usually end up to the side of the center line. I aim for “like a butterfly landing on a hot tin roof” and yesterday it was more like “just keep the liquid in the cocktail.” I didn’t rattle any fillings or break anything, so there’s that. I came in a little fast on my first attempt yesterday and bounced the airplane. I opted for an immediate go-around and the landings after that were fine, just not as precise as I wanted them to be. Perhaps I strive too hard for perfection. This week I’ll be working on landing on a grass strip for the first time and logging a cross-country hour or two. Posted on 30 Jul 15 by J.P.
Video of our taxi activity and departure from KOSH on the last Sunday morning of EAA AirVenture 2015. Video: Oshkosh 2015 Fisk Approach and Arrival. Posted on 29 Jul 15 by J.P. Flying into EAA AirVenture 2015 for the first time. Posted on 19 Jul 15 by J.P. I know I haven’t updated this blog in quite a while. Lately, Share Aviation, Twitter and Facebook grab the lion’s share of my attention span when it comes to sharing my aviation adventures. I decided that I need to give some aviation love back to my blog, so here I am, reviving it. I have about 20 hours of video sitting on my hard drive awaiting editing; I’m hoping to get catch up on all of that over the next couple of weeks. Last weekend I logged my 100th hour in my log book. I think this is rather impressive, considering that I earned my PPL at hour 66 in December and the Central New York winter wasn’t really hospitable to aviation adventures this year. In addition, I started a new job in June, and I was traveling all over the country for that new challenge for two weeks, so being able to still get in 34 hours in six months is good in my book when it comes to a being essentially a “weekend warrior” kind of pilot. Contrary to my original plan of immediately getting ready for my instrument rating, the past 34 hours have been devoted to honing my skills, learning new things as a VFR pilot and most importantly, enjoying my love of aviation. I’ve buddied up with a couple of other newer pilots and we’ve taken turns riding safety pilot for each other practicing landings and approaches, maneuvers and getting in some foggles time. I’ve logged a few cross country trips since earning my ticket, which has been very enjoyable. For my 100th hour, my friend Chuck and I up went up in the Cherokee 180 and flew from KRME to KSYR to shoot the ILS approaches at both airports. It was my first time shooting an ILS. I did it without foggles just as an “introductory experience” to doing this. It was also my first time flying into KSYR, or any Class C as PIC, which isn’t really different than flying into the Class D at KRME but it was a little bit of a big deal to me. I grew up in the Syracuse area and even as a small child I really loved watching all the airplanes go in and out of the airport. My grandparents lived closed to the airport and I can remember spending many summer afternoons playing in the back yard and watching all the air traffic overhead. Briefly I wondered if there was some young person down below watching us fly over just as I did so many years ago. This week we are flying to Oshkosh, Wisconsin for EAA AirVenture Oshkosh. We are leaving on Wednesday morning with plans on arriving during the allowed traffic window between airshows on Wednesday. We have hotel accommodations in Appleton but I might spend one night under the wing of the Cherokee 180. If you’re in the area, feel free to stop by and say hello. If all goes according to plan we’ll be parked in VAC / Vintage Camping. Posted on 26 Mar 15 by J.P.
With hints of spring finally in these parts, I’ve been lucky enough to get some time in the air in the club’s newest addition, the 1966 Piper Cherokee 180C. 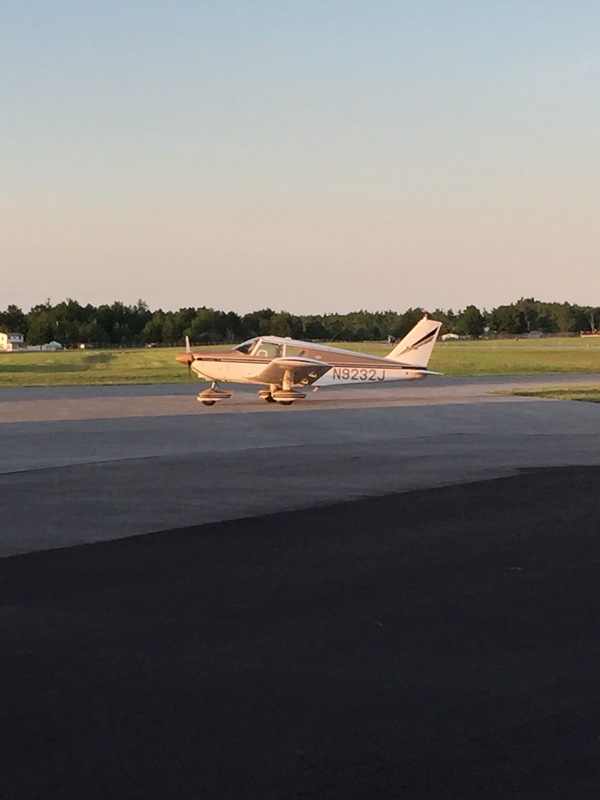 Tuesday night was an exceptionally great night to fly, so I planned some cross-country time from KRME to KART (Watertown, N.Y.). I planned the trip to go by way of the eastern shore of Lake Ontario, flying directly over the house I grew up in, the little airfield my dad and grandfather called home and the (snow-covered) sandy beaches along the lake shore. 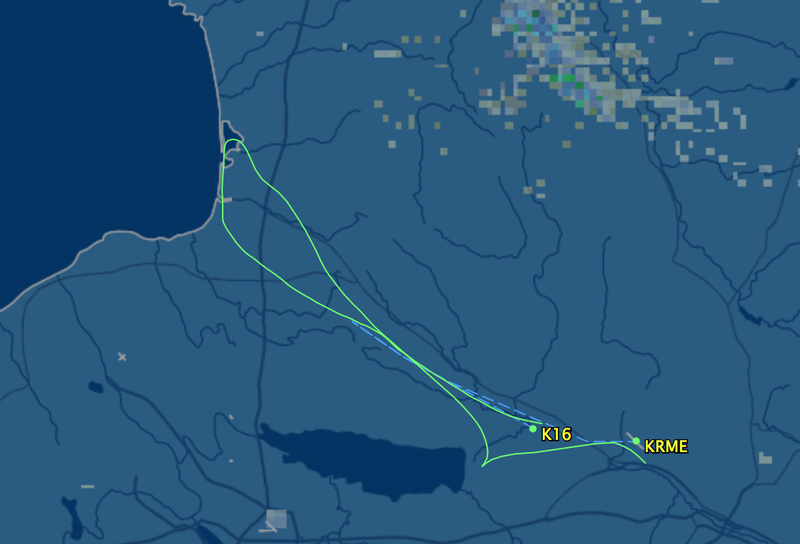 I had always wanted to fly this route as a kid; I’d been in the air in that area of plenty of times as a passenger but I had never flown into KART nor had I flown up in that area as a private pilot. The preflight of the 180C revealed that the landing light wasn’t working. Since I planned on getting night current while up at KART, not having a functioning landing light was a bit of an issue, so I scrubbed my cross-country flight plan. I decided to still fly up and over where I had grown up. I’d do an orbit over Sandy Pond and then head back home. That would get me back on the ground at sunset. The air was fantastically smooth as glass. This was my first flight in the 180C completely solo. The airplane handled beautifully, my comm work was grand and I felt wonderful. The MOAs (military areas) near Fort Drum were hot (active), so I stayed plenty clear of that area and flew right along the coast line of the eastern shore of Lake Ontario. At about Sandy Pond, Syracuse Approach let me know that I was at the very top of their area, so I turned south and started the journey back home. I’d get home right at sunset. I had a great big grin on my face as I flew over my grandfather’s old farm and the house my father built. I flew the pattern at the airstrip (1NY3) about a mile away. Wow, that 2200′ grass strip looks tiny when you’re used to nearly 12000′ of runway at KRME! All in all it was a great experience and just another affirmation of why I became a private pilot: because flying is awesome!